Amid the torrent of 2016 Volt teasers, Chevrolet managed to sneak a surprise into the 2015 Detroit Auto Show proceedings. The Chevrolet Bolt EV concept previews a possible production electric car with 200 miles of range and a price tag of around $30,000. Currently, nothing short of a Tesla Model S delivers range like that, and the Tesla costs way more than $30,000. Chevy also says the Bolt is designed to be sold in “all 50 states and many global markets,” unlike the current Spark EV, which is only sold in California and Oregon. 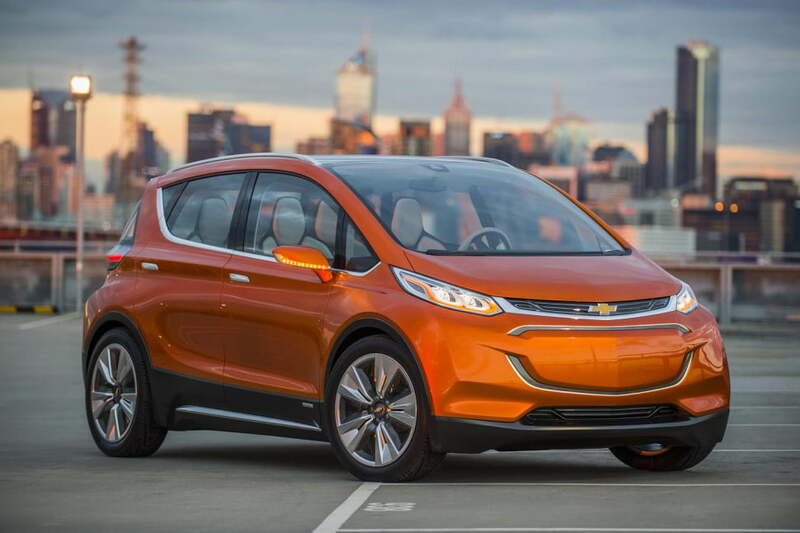 There have been a lot of rumors of a 200-mile electric Chevy, often involving a plug-in Sonic. However, the Bolt is an entirely separate design. With wheels pushed out to the corners, a virtual lack of overhangs, and a tall roof that allows for plenty of glass, the Bolt looks a bit like the generic future cars that populate Science Channel documentaries, albeit with some sporty touches. Lightweight materials like aluminum, magnesium, and carbon fiber were used to help increase range, and the Bolt’s sleek profile should help in that area as well. In addition to the copious side glass, the interior is made to appear roomier with a full glass roof. The center console and seats – the latter mounted on exposed aluminum pedestals – feature a minimal design that’s also meant to convey a sense of airiness, but maybe were also intended to help keep weight down. An electric powertrain isn’t the only nifty piece of tech on the Bolt. The Bolt EV Connect App allows the driver to use his or her smartphone as a key fob, coordinate car-sharing by allowing users to pay and access the vehicle through the app, and engage a valet feature in which the Bolt parks itself, and then returns to pick up the driver at a set time. The Bolt also features multiple driving modes that adjust accelerator mapping, ride height, and suspension tuning to suit different drivers’ preferences. It also features DC fast-charging capability for quicker recharge times. Limited range is one of the main drawbacks to electric cars, so it will be interesting to see how the Bolt will affect the market if Chevy can actually put it on sale for $30,000 in significant numbers. If that happens, the Bolt could become just as significant as that other Chevy electric car, the one with almost the same name.